The Oil & Gas sector is subject to high quality requirements because the quality is inherent to safety, service lifespan and costs. It is for this reason that our qualified Q.A. manager assures the highest level of contract management and product control, and continuously invest in improving our business process. 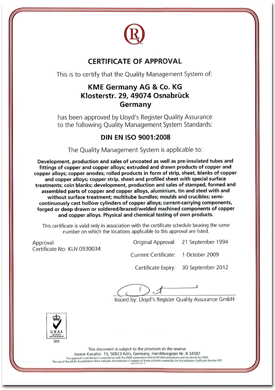 Certification is essential for our products and each item is supplied with an original mill certificate. 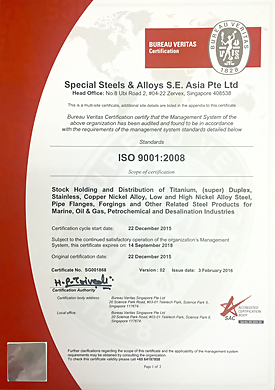 If required, a dimensional drawing and associated strength calculation will be attached to the applicable certificate. On client’s request, in-house skilled and qualified personnel can carry out LDP and Ultrasonic/Level II surface examination in accordance with the applicable standards. Additional tests in order to meet the client specification and/or upgrade the material to EN10204/3.2 certificate can be carried out, witnessed by any third party inspection authority. All projects are handled by a task force project team which is well-experience in technical matters and progress control. Please click on the images to download the ISO certificate.